Hope everyone had a great night stitching. I worked on a couple of things. 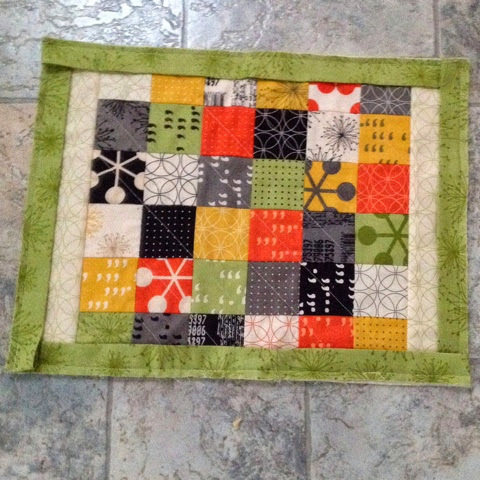 First up I made a scrappy placemat. The pattern is by Sherri McConnell of A Quilting Life. It uses mini charm squares. I had a mini charm square pack given to me in the Fat Quarter Swap Birthday Swap. It was Comma by Zen Chic. I fould some yardage on special at the Fabricpatch so got that express posted to me during the week. Of course there were other goodies as well. The progress so far. Just need to stitch the binding done but was waiting for better light to select the cotton. I am going make some more placemats. 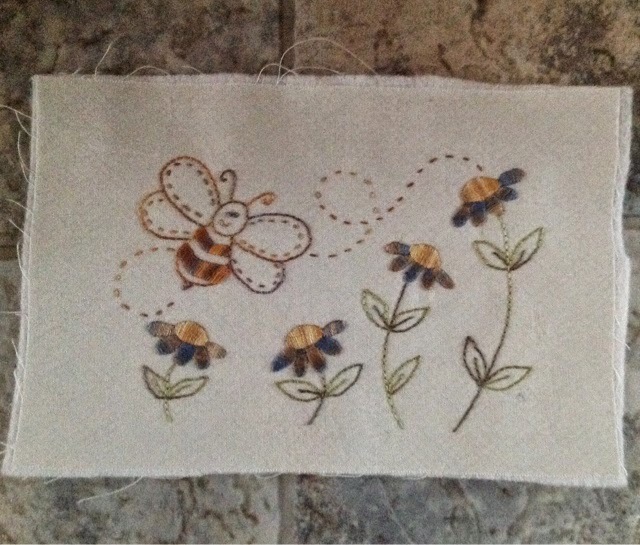 I also finished off another stitchery for my Little Creatures. Only two more left to do before I can put the top together. So loving the cute designs and if you haven't tried Cottage Garden Threads I can really recommend them. Thanks Wendy for being such a lovely hostess. Hope you enjoyed your sugary treats I didn't partake in the sugary treats as I had a dentist appointment this morning. Lucky no problems it is not my favourite place to go even though my dentist and his nurse are really lovely. Hope everyone is having a lovely stitchy weekend. Your work is always so lovely. What a delightful stitchery. The stitchery is so cute Kim - great progress with the blocks! I like your idea with the charms too, I have some but never can think of what to do with them!